As stated earlier, the device is priced keeping in mind the budget-sensitive users. Its MRP is Rs. 8449 and users will be able to purchase it at even lower prices. At this price-point, it will be up against smartphones from other local manufacturers like Karbonn S2 Titanium, Lava XOLO Q700, etc. The main feature of the device is its 5 inch screen which will surely be a nice feature for those who want to enjoy the large screen experience. 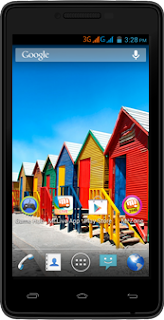 It is loaded with Android 4.2 (JellyBean) with a lot of Micromax’s customizations. It will have several apps preinstalled such as M!Zone, M!Security from Micromax as well as Hike, Spuul, Opera, etc. from third party developers. A76 has a very trends design with availability in colors such as Black, Blue and Red. Apart from that it has almost similar layout in terms of buttons as present in other Micromax devices. The front is mainly covered by the touchscreen, while an earpiece and front camera is present above it, and capacitive buttons are present below it. Left side features a volume rocker, whereas power button is at the right side. The top has earphone jack as well as microUSB port, used for charging or data transfer. 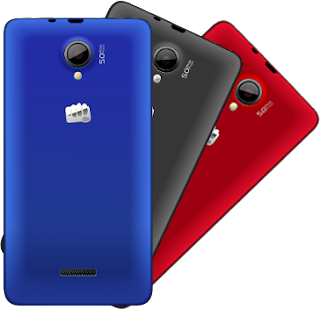 The back of the device has a rear camera along with Micromax branding and speaker grille. It has a 5 inch screen with resolution of 480 x 854 pixels, resulting in decent pixel density of 195 ppi. Screen offers color depth of 16m colors reproducing good colors with adequate brightness levels. Internally, it’s powered by a MediaTek 1.2 GHz dual-core processor paired up with a 512 MB RAM. This would be sufficient for multitasking or playing powerful games, but it may hang sometimes as Android usually works well with a 1 GB RAM. For memory, it has 4 GB internal storage out of which only 1.25 GB is available to the user, but it doesn’t bother since it allows memory expansion up to 32 GB via microSD card. It’s fueled by a Li-Po 2000 mAh battery which gives it talk-time of around 7 hours. For connectivity purposes, it offers usual features such as 2G and 3G support, Bluetooth 2.0, Wi-Fi and GPS. It comes with 5 MP camera at the back with LED flash. It gives good quality of images for casual requirements. It’s also capable of recording videos with resolution of 1280 x 960 pixels. For video calling needs, it offers a front-facing camera of VGA quality. The Guest Author of this post is Julia. She wrote several tech posts for 91mobiles.com. Also check out micromax canvas fun a76 price in india here. Her passion for upgrading her knowledge puts her to research on topics relevant to her industry. Besides, she also likes to share her findings by writing about them in her free time.